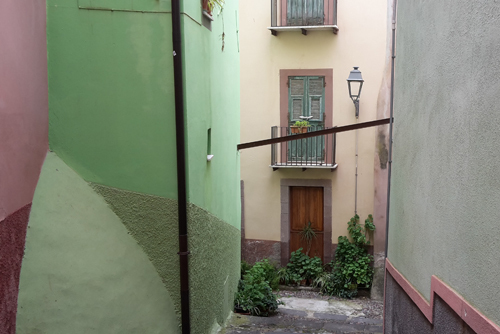 Last month I spent a week at Bosa Art School in Sardinia with Carey Mortimer. We are both ridiculously interested in the Roman fresco technique and decided to get together to develop a Roman fresco course to be launched next year in Bosa. The technique, as typified in the villas of Pompeii, differs from the buon fresco technique used by the Renaissance artists such as Michaelangelo. Instead of using sand as an aggregate, marble powder is mixed with the lime putty to make the plaster. This creates a smoother surface which can be polished with a tool such as a spatula – or even a wild boar’s tusk! Certain pigments, once painted on, can also be polished. 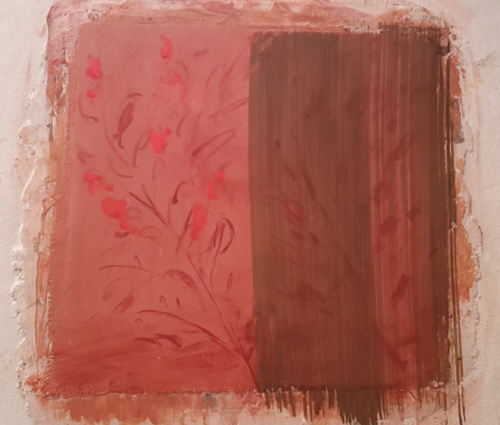 The addition of wax emulsions either to the pigments or on top of the finished piece can add to the lustre. Carey and I decided to start the week making various samples. 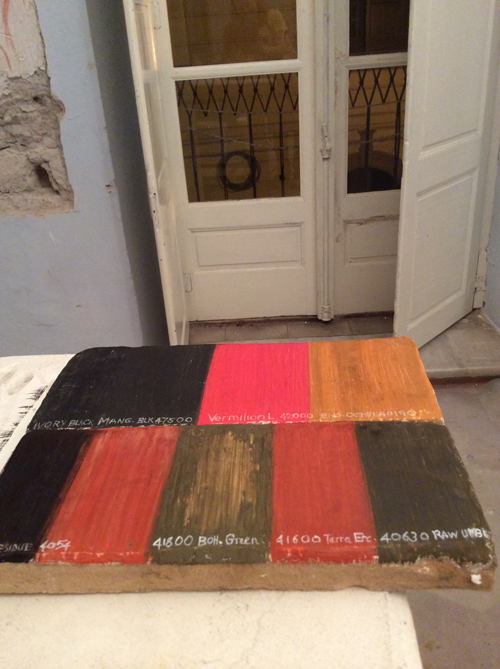 We used tiles as our surface, each trying a range of pigments, such as raw umber, yellow ochre and burnt sienna on the plaster. We experimented with leaving the colours different lengths of times before polishing. We also polished some for longer than others. We had particular fun with various blacks. Carey had got hold of some residue from the wine making process and had dried it out. This created an interesting soft and grainy black. I particularly liked the more modern manganese black, which shone up to a dark pewter colour. 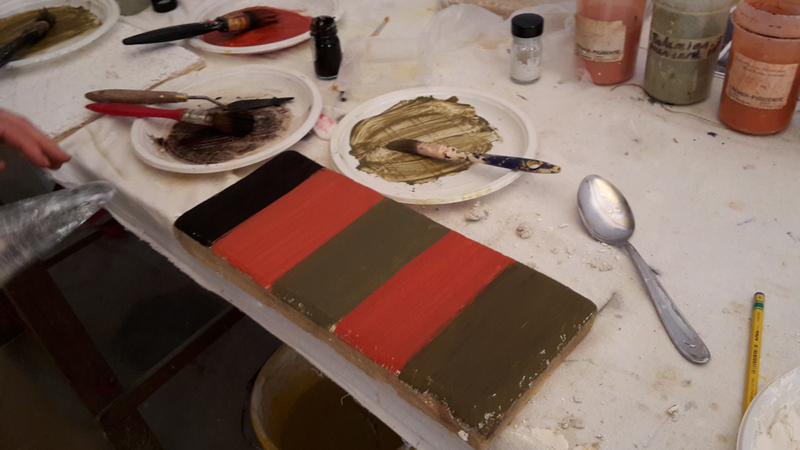 Carey had previously made two different kinds of wax emulsion – one was beeswax mixed with ammonia and we used this with some of the samples to create the effect of polished marble. The other emulsion was from an ancient recipe by Vitruvius ; this is called punic wax and it involves combining beeswax with sea salt, soda and ammonia, bleaching it for months in the sun, then pulverising it and mixing it with water to form a paste. It sounds like quite a palaver but, after plenty of bashing with a hammer, we finally got the stuff to emulsify and it worked an absolute treat. I tried this on top of one of my larger samples but found I needed to hold it over a flame in the kitchen in order to spread it properly on the surface. They would have used hot coals in the Roman times or perhaps the hands of many slaves on unbearably hot days to spread the wax on the huge surfaces, while the owners of the villas lounged on couches being fanned and fed grapes by other slaves. The Villa of Mysteries in Pompeii, for example, must have caused a lot of slaves to sweat. As we had no slaves, let alone assistants, we decided to keep things small. In between preparing samples, we discussed the content of the course and how it would proceed from day to day. We looked at books for inspiration and reminisced about our time in Pompeii just eighteen months earlier. There was time later in the week for me to work on some slightly larger panels and Carey also showed me the technique of autostaccante, which is a useful way of painting a fresco on a temporary surface and then removing it and attaching it to something lighter in weight. 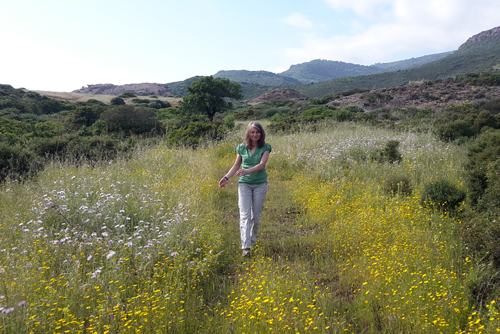 I also had a tiny bit of free time to look around the lovely town of Bosa and walk through a beautiful meadow full of flowers on the way to a freezing cold dip in the Sardinian Sea. On my way to the airport, I stopped in Alghero for a day. 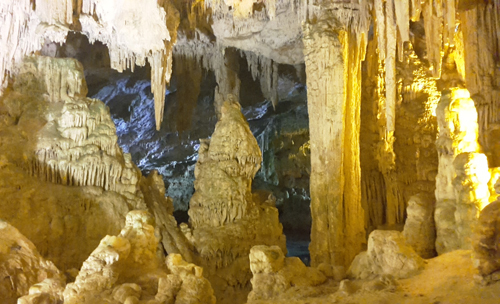 I visited Neptune’s Grotto by boat. On board I bumped into a group of archaeology enthusiasts from Brighton who were having a day off from their archaeological tour of Sardinia. I cerainly did not expect to meet people who were so interested in Roman sites and I am sure they did not expect to meet me just fresh from being up to my elbows in marble powder and polishable pigments. It was indeed a serendipitous moment and I think the Italians on board, who all seemed to be discussing some Royal Wedding, must have thought us most strange.